Freedom Manufacturing LLC located in Saratoga Springs, New York is the only approved manufacturer of the U.S. Forest Service fire shelter polyvinyl chloride (PVC) bag. Freedom Manufacturing is offering complete fire shelter re-bagging services starting in January of 2011. Freedom Manufacturing will remove your shelter from the old PVC bag and reseal the shelter into a new U.S. Forest Service approved bag including a web strap with Velcro™ and tape reinforcement. Regular shelters will have a yellow pull strap and large shelters will have an orange pull strap with the word LARGE stamped on the webbing. Your organization will be responsible for the inspection of the fire shelter and only send viable shelters for re-bagging. Please refer to the "Fire Shelter Inspection Guide" for clarification. Any questionable shelters will be returned not re-bagged because the safety of the fire personnel is paramount. If you wish to participate in this re-bagging program please email: fireshelter@twc.com with the number of fires shelters you will shipping for re-bagging. Your organization will be responsible for the cost of shipping the fire shelters to and from Freedom Manufacturing. Acceptable payment is MasterCard, VISA, or American Express charged to the card on file on the date of return shipment. Please provide your FedEx or UPS account number for return shipment. If your organization does not have a shipping account, the shipping charges will be added to the total cost of the order. If you are unable to pay using a credit card, please contact Freedom Manufacturing at 518-584-0441 EXT 12 to determine the total cost of re-bagging and arrange for a check to be sent prior to shipment. COD is also an option for payment. Complete and copy the re-bagging order form. Fax one copy to Freedom Manufacturing at 518-584-0421 and enclose a second copy with your shelters. 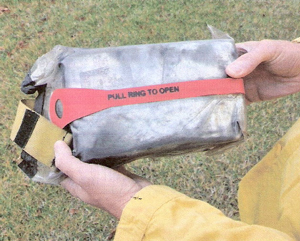 Remove the fire shelters from the blue nylon duck carrying case and the hard plastic liner. Only send to Freedom Manufacturing the fire shelters in the PVC bag. DO NOT REMOVE THE SHELTERS FROM THE OLD PVC BAG! The shelters need to be protected in the PVC bag during shipment. Be sure that your shipping boxes are sturdy enough to safely transport the shelters. Tape both tops and bottoms of the boxes securely. Consider purchasing shipping insurance for your order. Counting of the shelters must be accurate. Any discrepancies between the order form and actual count will delay the re-bagging of your order until the correct count is confirmed.